When engaging a prospective client one of the first questions asked is “How much does an app cost to develop?” I also get asked this question frequently by friends, family, and associates at parties. Many developers have tried to answer this question — often with unspecific results that aren’t helpful. Cost can fluctuate when you factor the project, the developer, and the quality of the final product. Many people are only interested in a quick estimate, in which case I offer the simple analogy: the cost of a mobile app is comparable to the cost of building a home. What does the cost of a house have to do with developing software? I’ve shipped hundreds of apps — both large and small — using this analogy to prepare client expectations. However, the only way to get an accurate assessment is to have the developer build a detailed bid — a process that can take an experienced developer days to get right. If you aren’t building the app yourself, you should find a developer that is prepared to offer a comprehensive breakdown of cost instead of a large round number. Be weary of any bid that looks too simple or the numbers too good to be true. Many developers will bid low to get you to sign and then ask for additional fees later. Above all else, consider the technology used to construct your project. There are several frameworks that offer significant cost savings such as PhoneGap, Titanium, and MonoTouch. However, these savings come with their own cost. They allow developers to work in a non-native language with their own abstractions. This can create artificial limitations on both functionality and performance. Consider a pre-fabricated home: while they are very cost conscious they make trade-offs in quality, ability to customize, and uniqueness. An app built upon an existing framework has many of the same frustrations as a pre-fabricated home. The app will be limited not only in the customization of features but more noticeably in the performance and stability, which can effect the perceived value of your brand. A custom native app built by an experienced team will allow for years of expansion and growth. It has total flexibility, and allows you to build any wacky thing your heart desires. Like a home, apps come in all shapes, sizes, and designs. Do you want a one bedroom shack for $50,000 or a mega mansion for $2M+ similar to Facebook, Twitter, or Instagram? As with homes, many clients opt for a starter size for their first app. This allows them to build a solid foundation that will be setup to grow with them for years to come. In February 2013, the average cost of a house in the US was $152,000. By our estimates inside of MartianCraft, the average cost of an app is approximately $120,000. A basic app will provide a solid foundation for growth but very little in the way of extravagance. It will serve the needs of your business now but you may find yourself shopping for an upgraded model in a year or two as you grow. Some clients opt for a solution they can grow into without worrying about the cost of remodeling. These types of apps typically run over $300,000 or more, depending on complexity and features. You can save a lot of money by hiring someone without much experience. As with everything in life you will get exactly what you pay for. 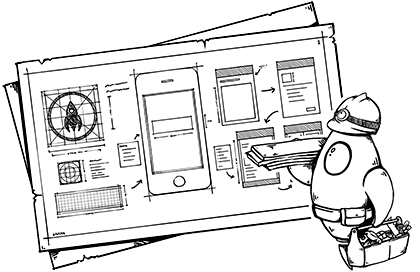 Designing and developing apps is about breaking a problem into its simplest parts and solving those. The more experience a developer has, the faster and better they can solve these little problems. A junior developer will often negate your cost savings by taking longer to deliver or making costly missteps that reduce the efficiency of the process. While a senior developer may have solved this same little problem a dozen times in their career. There are also unanticipated costs such as marketing, promotion, data acquisition, IP licensing, hosting, third-party integration, and more. An experienced developer will anticipate these costs and help you budget for them. You’ll get a quicker answer since a senior developer won’t first need to research the problem and potential solutions. Our analogy glosses over one critical difference between app and home pricing: resell value. You expect a home will accumulate value – just give it time. Apps are a different story. An app such as Instagram can cost hundreds of thousands to develop before getting sold for a billion dollars. However Instagram is far from the norm. Many apps that do not catch on or fail to gain a following are worth close to nothing. No amount of time on the market can change the loss of investment, once an app has failed. Quality components is the difference between an app with resell value and one without. If a buyer can recreate an app for bottom dollar using a template, then there is little interest. Software engineering isn’t cheap. High quality development costs money, but it lays the ground work for many years to come. Like building a home, laying a solid foundation and doing things the correct way will provide you a base to build upon and grow. Building the right app the first time can save you from building the wrong app two or three times.